Jess and Nick were bound to break your heart. 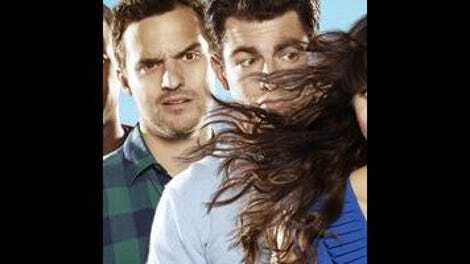 The connection between Zooey Deschanel and Jake Johnson was present from the start, one of New Girl’s first noticeable sparks of life—and a connection that remains evident through the end of “Cruise,” the show’s third-season finale. But that never meant they had to be together romantically—and it doesn’t mean they’re going to reunite. As much as “Elaine’s Big Day” was about the romantic rush of New Girl ending a season by following its heart, “Cruise” is about the satisfaction that comes with recognizing that Nick-and-Jess are no longer Nick-and-Jess. It’s not closure, per se, but it’s often just as gratifying. To reinforce that the characters will eventually be okay with one another (they have to be, to one extent or the other, because it’s an ongoing TV show), New Girl once more traps them in a scenario where they’re forced to work through these still-raw emotions. Personal space (and lack thereof) has been a constant topic of conversation in the third season—and “Cruise” takes that to greater extremes than even “Mars Landing.” Usually, the roommates have the whole of Los Angeles to get away from each other, a big ol’ television oyster filled with people like Tran or temporary refuges like the bar or the zoo. The not-so-subtle ingenuity of “Cruise” is in its namesake setting’s isolation: Nick and Jess can flee to opposite sides of the boat, but the only true way to get away from their problems involves jumping over a railing. “Cruise”’s big joke is that the trap becomes all too real, a state-room nightmare depicted on the business end of an expertly deployed Gilligan Cut. That’s the kind of gag that rewards the viewer for knowing exactly what will happen next; it’s the opposite of the episode’s other big example of comedy-by-editing, the “grand romance package” montage. (Find grand romance package wherever quick-hardening caulk is sold!) The sequence playfully subverts expectations for a Jess-and-Nick reunion, encompassing the sort of tug-of-war that defined much of season three: arguing that the couple works while demonstrating why they don’t. They’ve broken up, and New Girl sticks to its guns—just like it did when they got together in the first place. It’s an admirable trait for a series that could spend the rest of its run waffling back and forth on this central romance. Because any romance struck up between characters on this show will never be as important as the relationship fundamentals at its core. And that’s a highfalutin way of saying it’s frustrating to see “Cruise” bring Jess and Nick to that point while stubbornly refusing to snuff out the torch that keeps being passed between Schmidt and Cece. To watch one couple get comfortable with being friends only highlights how season three lost the thread with Schmidt. The season treated Cece just fine, giving her a new career, new outlook, a GED, and a hunky boyfriend. Max Greenfield’s character, meanwhile, got flattened by the fallout of his love triangle, and one of the many services Damon Wayans Jr. performed during Coach’s triumphant return involved making up for the deficit of laughs that could’ve gone to Schmidt in a previous life. “Cruise” nearly (and wisely) veers off of this path, thanks to Winston’s indulgence of the Wave Dancer’s “Grumpy Gus” policy. Between this, his discovery of Nick and Jess’ “opposite sides of the boat” strategy, and the horrifying way he exits Schmidt’s bedroom, Winston is clearly the hero of the season finale. Winston also acts as the connective tissue in “Cruise,” and while there’s one way to read this as proof that the character still never gets storylines of his own, I like how it also presents him as the glue in this group of friends. General silliness aside, he’s always been the most upstanding, ready-for-the-world member of the ensemble, a sense that accompanies Lamorne Morris’ ability to toggle between straight and absurd at a moment’s notice. As New Girl gets older, Winston develops more into the spirit animal of the program, the guardian and primary practitioner of the sextet’s weird vibes. That dynamic is the most purely comedic part of the series, one I’ve always had trouble defining beyond its fundamental enthusiasm. Naturally, when that enthusiasm is stuck behind a locked door for three days, a devolution that’s both general to humanity (the whole Lord Of The Flies tableau in the state room, complete with “talking soap”) and specific to this group of people (a New Girl riff on William Golding looks an awful lot like a broken-down game of True American). Either way, the dynamic remains infectious in the manner of all good hangout sitcoms, an inviting, in-the-loop sort of feel that fosters and kinship with the show and a desire to look in on these characters every week. I don’t mean to sound like I think “Cruise” is some sort of microcosm of season three. It’s not as tidy as that. It does, like a lot of the third season, spend its opening passages getting too interested in new subjects—Coach’s fear of boats, guest stars Oscar Nuñez and Kerri Kenney-Silver, Schmidt’s distaste for nautical puns—before blowing past all that to get to the meat of the program. It’s a bit of a waste, especially because Kenney-Silver’s kooky Captain Jan Nortis fits so well in this world—but you don’t stick around as long as New Girl has on the strengths of your guest-casting. The key to this show’s continued success is and will always be the six people featured in that “family portrait” that closes the episode, the actors and characters who never have to strain for laughs so long as they’re all framed in the same shot and given room to bat jokes around. “Cruise” goes all in on that front, doing an exceptional job of letting the cast earn its laughs by being present and in the moment in longer takes like the loft tag and Coach’s evacuation drill. 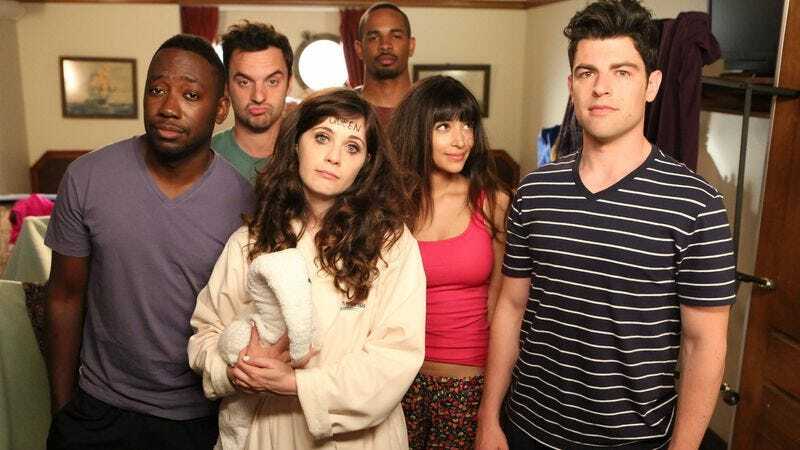 Season three was a shakier set of episodes than New Girl’s stellar sophomore season, but when everything was calibrated appropriately, it was still one of the most enjoyable places to hang outs on TV. Even when that place is a stinky, messy, claustrophobic room on a cruise ship. Scratch that: Especially when that place is a stinky, messy, claustrophobic room on a cruise ship. Showing the newspaper photo is a decent payoff, but part of me is a little miffed that the tag of “Carnival” doesn’t go for the full Cheers homage, paying tribute to one of the greatest season finales of all time by leaving the audience looking at the living “family portrait” captured on our TV screens. New Girl is now 2-for-3 in terms of bringing a member of The State aboard for its season finales. Maybe Michael Ian Black, Michael Showalter, and David Wain can take the gang turkey hunting at the end of next season. And that does it for The A.V. Club’s coverage of New Girl’s third season. Thanks for sticking with us through the rough patches (though I’m still unconvinced that the beginning of the season was as bad as some made it out to be), and I’ll see you again next fall. (If you’d like to keep the conversation going, you can find me on Twitter at @ErikMAdams.) Until then: 1! 2! 3! 4! JFK! FDR!